Another one of our Rhode Island Red hens is laying now. I found her yesterday morning, hopping out of a laying box. She had just laid it, too. Since I rarely get to see them lay, it was a treat. Tiny little thing, isn’t it? I can’t get over how small there Rhode Island Red eggs are, but I guess since they are all new layers and not very old, they had room to get bigger, right? 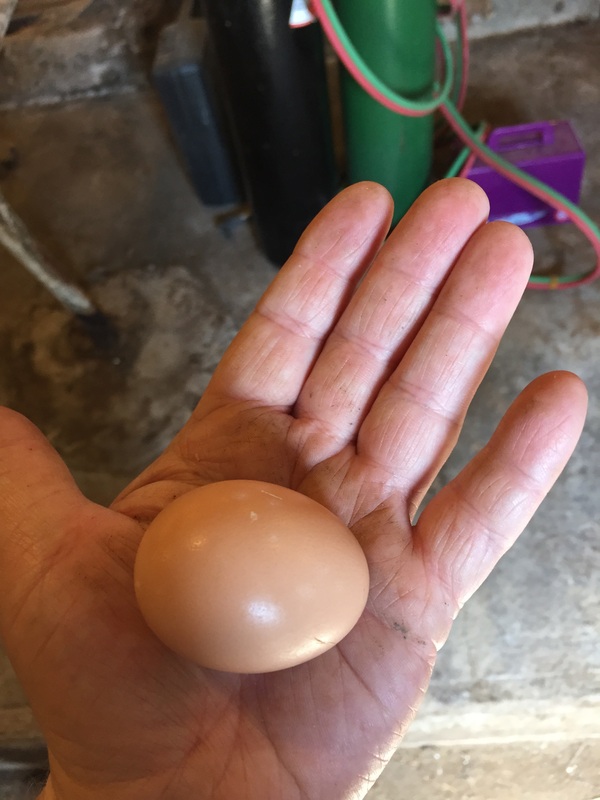 I think most hens start out laying smaller eggs, and they usually get bigger. 🙂 One of my newbies laid her first egg yesterday too, I’m not sure which one though – but the egg was very small. I’m not sure why, but I had it in my head that the RiR eggs would be bigger than the sexlink eggs. That hasn’t been the case. Abby (my currently broody sexlink) still gives medium sized eggs, and her two ‘sisters’ are laying large/x-large as 5 month olds. The RiR who started laying a week or so ago is still laying tiny eggs, and this New Girl’s egg was smaller than that one. What’s also amusing me is that the RiR eggs are more of a ‘creamy peach, skin tone’ color, where the sexlink girls are a dark brown. They make for interesting comparisons. 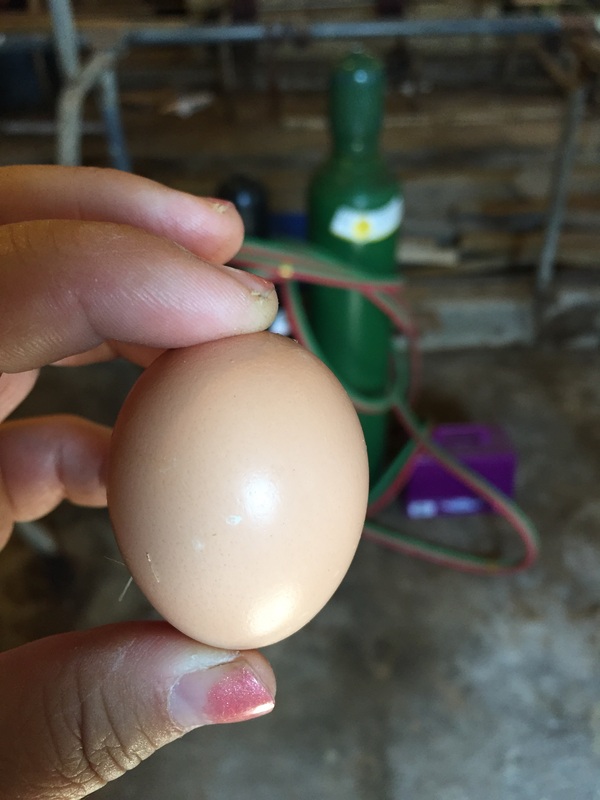 What kind of hens do you have? Mine are just the sexlinks and the RiRs, and I’m having a terrible time telling the RiRs apart. I just know Ihave 2 laying now because I have seen them in the boxes, and I know which laying boxes are being used for eggs and which are still collecting dust. And even though I have seen them laying, I couldn’t point to the hens in the barn yard and tell you who is laying. Going to solve that soon, though. I’ve decided to put numbered leg bands on them, so I can keep track. That way, I can identify the ones I see in the laying beds, and also if they have illnesses I will know which ones by the number.